A few years ago, during Oprah Winfrey's famous TV show, Pontiac decided to give 276 new cars among the spectators. This strategy of marketing, never taken before, supposed a strong impact for General Motor's subsidiary, giving its a higher reputation and a major renown that any other conventional campaign. Pontiac published that the cost of giving 276 new cars was minor than his previous campaing on TV. This year Audi has decided to use a very similar campaign. 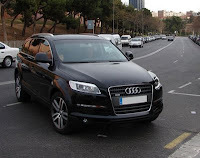 A model of Audi has been given to every player of Barça, insuring itself in exchange that the player should always go to the trainings and concentrations before the game driving by the selected model. With this strategy, Audi assures itself a brutal impact of the brand every day on the sports news. On the other hand, and as a personal opinion, I also believe that this is a good way to preserve the image of the players and the Club they represented. Not always it is advisable to see the players arriving with a Ferrari, a Bentley or a Hummer, specially when the football results are not satisfactory. No està mal aquesta campanya. Audi crec recordar que va fer el mateix farà uns anyets amb el R.Madrid dels galàctics.